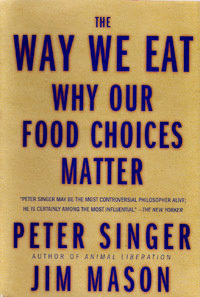 They say you are what you eat, and that’s the premise of the new book by well-known Princeton philosophy professor (and author of Animal Liberation) Peter Singer, writing with attorney Jim Mason. The book is entitled The Way We Eat: Why Our Food Choices Matter (Rodale), and it is the most thorough guide yet published to the issues that accompany every laden plate. The Way We Eat can be seen as a logical successor to Animal Factories, the first collaboration by this pair back in 1980. Animal Factories was the first major factory farming expose. With The Way We Eat, the pair take on some of the myths and assumptions around what is known as the classic American diet. What’s behind fast-food restaurants selling whole meals for a buck? Is the craze for Chilean sea bass and orange roughy sustainable? Is organic the best way to go? Is the vegan diet healthy? And what exactly are "cage-free" eggs, exactly? I do not come to this book as a disinterested party. I am, in fact, one of its subjects. The Way We Eat profiles three families, one that opts for traditional meat and potatoes, one that leans green (us) and one that follows strict vegan principles. My family, including my wife Mary Ann and our kids Delia, 9, and Maya, 12, are what the authors call "compassionate carnivores" (or at least they are; I’m a vegetarian who eats fish, if that’s not a contradiction in terms). The authors write, "We chose them because of the ethical principles—leaning to green, coupled with concern for animal welfare—that guide their food choices. Mary Ann and the girls eat meat and animal products from humane and organic farms. When we asked whether she developed good eating habits while growing up, she laughs and says, "We ate Spam! I absolutely loved grilled Spam. My mother made what she called "red spaghetti" but it looked orange—it was Campbell’s tomato soup and milk and Velveeta cheese mixed together over spaghetti. And that would go with the Spam."" 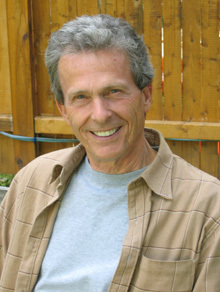 Jim Mason recently sat down for an interview about The Way We Eat. E: What’s wrong with the way we eat? The book looks at the concerns consumers have when they buy food at the supermarket and in restaurants. It’s not about health issues—what makes you fat or where you get your protein. It’s about farming and production and buying and eating ethically. And that means to not harm the environment, animals, farmers and workers. Your food choices have repercussions. For example, what’s wrong with the American food system is a lack of transparency, meaning that it is very hard to get information from Kraft, Oscar Mayer or other big food conglomerates about where their food comes from. All we know is what they sell us in advertising. We structured the books around the eating practices of three families. We ate with them and shopped with them and listed all the foods they bought: milk, eggs, frozen food and produce. If they had fast food, we traced that, too. We made a master list of all those foods and tracked down the brand owners, then asked them to cooperate with us in tracing those food items back to the farm. We ended up with a list of 87 companies, including the biggest names—Kraft, Tyson, Oscar Mayer, Coca Cola, Burger King, McDonald"s—and all the way down to smaller organic producers, like Pete and Gerry’s Organic Eggs. We got only a handful of replies, mostly from the organic people. We followed up with a second letter begging these companies to cooperate. In the end, we got only 14 replies of any kind, and that included hostile responses, such as the angry phone call we received from the president of Omaha Steaks. He told us he didn’t like our ideas. Kentucky Fried Chicken [ed: just sued by the Center for Science in the Public Interest because of its continued use of trans fats] said it did not "agree with your agenda." The point is transparency and these companies just don’t answer questions. We said to Oscar Mayer, "We have a family that eats your bacon. Where are your pigs and can we see them?" They replied that it was a peculiar question to ask. Their suppliers tend to be proprietary information. Pork bellies turn out to be a commodity, sold by the ton like cotton, coal or oil. It’s not as if the pigs are coming from family farms. So what would real food transparency look like? You would buy your eggs at the local market, and we could trace those eggs to chickens and eggs back to where they came from. The retailer would put us in touch with his or her distributor, and that would lead to a wholesaler, and they’d say it all comes from a farm in New Hampshire. So we could go there and see the conditions. Instead, if they say anything, they say, "Gee, I don’t know." People tend to think that all dairy products come from cows that live in green pastures, but there aren’t any big farms like that. It’s all large-scale factory farming now. Organic milk costs more for a reason. We went to a nice organic dairy in Pennsylvania. The Mennonite farmer was very nice about showing everything. And he had nothing to hide, because he left calves with their mothers for two months, which is almost unheard of on large farms today. They’re usually taken away on day one, even before they’re dry. It’s very hard on the animals. In the book, we cite the animal behaviorist Temple Grandin talking to Oliver Sachs about separation grief of calves and cows. How did find the families you used in the book? We started off with a long list that included friends and neighbors, and it was basically self-selecting as we eliminated people who didn’t want to have their diets tracked for months. We ended up with three families. The first was a family with two small children in the suburbs of Little Rock, Arkansas. They’re standard American meat eaters with no ethical concerns—they shop by price and convenience—and buy their food cheap at Wal-Mart, and eat out in fast food restaurants. The second family—you guys—are conscientious omnivores. You are careful about the source of your food and buy stuff that was organically grown, free range and humane. You want your fish to come from sustainable fisheries, and buy fair trade coffee. In short, you know that food choices have impact around the world. The third family, in a suburb of Kansas City, Missouri, is vegan, with the strictest of all ethical concerns. Everything they eat is plant based, organic and the product of sustainable farming. They don’t allow any junk food in the house. cows since 1935. The dairy buys its milk on the open market, and it could come from California or Arizona. Jake was shocked when she found that out; she felt duped. What are the main ethical concerns that the consumer public picks up on? The biggest are environmental concerns. People want food grown without pesticides, artificial ingredients or genetic engineering. They’re concerned about the impact farming has on the environment. And fair trade, which ensures that farmers get a decent wage and are not exploited, is emerging as a big issue. You can now find fair trade coffee in Dunkin Donuts and Starbucks. People also like the idea that their food was produced sustainably, that they’re buying local, helping farmers and the economy. And, of course, animal welfare. That was a taboo subject for so long, but people are now saying that they don’t like the way animals are treated to produce meat, milk and eggs. Is it always better to buy produce that was grown locally? It is generally better, but we found examples where buying local not the best ethical choice. Two examples are rice and tomatoes. If you live in the Napa Valley of California, you can buy local rice to help the environment. But it takes so much energy input to grow rice the agribusiness way in California that it is actually more energy efficient to buy rice shipped in from Bangladesh. If you look at the whole production process, their methods consume less oil than rice produced in California, even when the transportation from Bangladesh is figured in. In Easton, Connecticut, the Sherwood family has been growing tomatoes for 17 generations. But since they use oil heat to warm up the greenhouses and get an early crop going, it actually uses less fossil fuel to truck up tomatoes from Florida. But, of course, there are other concerns, including taste. And Florida tomato growers have been convicted of holding laborers against their will, in effect sanctioning slavery. Do we have to pay more for ethically grown food? Usually yes, because cheap food employs shortcuts to keep price down. Factory hog farms, for instance, pollute the air for miles around, dump waste in streams, exploit undocumented workers in packing plants and slaughterhouses. When you buy organic or sustainable food, you’re paying the fair-market cost rather than a subsidized cost. A version of this piece originally appeared in the Fairfield County Weekly.